Welcome back to our Game In Progress coverage of The Legend Of Zelda: Breath Of The Wild. In this final entry, Gameological editor Matt Gerardi makes for Hyrule Castle and takes the opportunity to look back at the adventure he had along the way. We’re not quite done with this game yet, though. Check back tomorrow for a discussion about whether it ranks among gaming’s all-time greats. Your assault on Hyrule Castle hammers home just how genius Breath Of The Wild’s structure is. When I started this journey and got my orders from the Old Man on the Great Plateau, I laughed as the words “New Objective: Destroy Ganon” zipped onto the screen. That moment is loaded with significance—a knowing joke to tickle longtime players, a symbol of the freedom BOTW allows, a wink at the slow-burning openings of past Zeldas—and from that point on, it sticks in your pause screen, reminding you why you’re wandering all over Hyrule, helping strangers and overcoming ancient trials. Throughout it all, you really only have that single goal. It’s delivered to you and made achievable immediately. You can see its physical form out in the distance, Ganon’s swirling purple mass hovering over everything you do. It’s just there, waiting for you, and the rest of the game, should you choose to dig into it, is about making sure Link is strong enough to win when you do decide to make your move. It’s yet another one of the ways BOTW quietly acknowledges its subservience to the player’s will. There’s no urgency here, no pressure to power forward and save the land as fast as you can. Without that, your time in Hyrule is able to fly by without the nagging feeling that you really should get on with the princess rescuing. That big mission will be there when you’re ready for it, and with it safely out of the way—looming and providing purpose to your actions but never dominating—the game leaves you to find meaning in whatever activities you want, whether that’s collecting fireflies to upgrade your ninja pants or walking the coast, looking for ancient secrets. And in the build up to the game’s grand finale, all of those hobbies and diversions prove useful. Those mushrooms you picked might come in handy. A Great Fairy will gladly accept those goblin guts to give you armor strong enough to withstand Ganon’s attacks. You’ll need those sword skills you practiced during that ill-advised fight you picked with a half-lion, half-horse bruiser. In the end, everything you did mattered. And then you’re left to decide when it’s time to make your move. For me, there was a definite tipping point after I’d tackled the four Divine Beasts and tracked down Link’s lost memories. I had become the most fearsome force in Hyrule, packed to the gills with beefy weapons and enough hot meals to get me through anything. I looked back on what I’d accomplished, what marvels I’d seen and what treasures I’d collected. I considered everything there was left to do, land gone unexplored and riddles gone unsolved. There was plenty more, but I was ready. After 60 hours of living and learning, my head was finally above water. 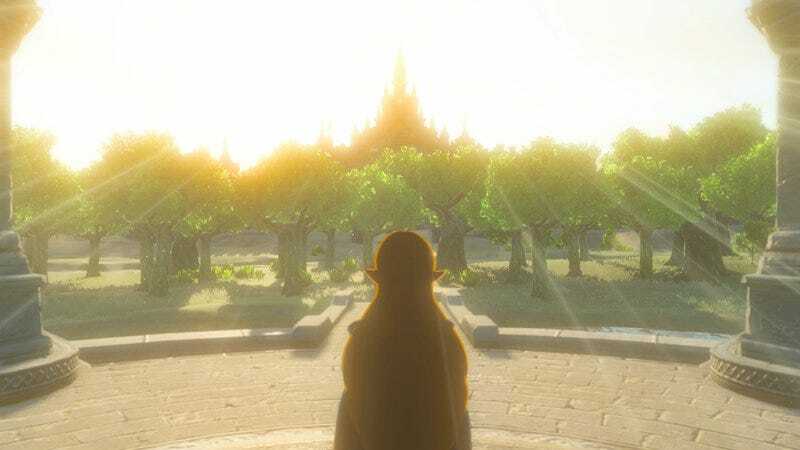 I stood atop one of Hyrule’s towering spires and stared off at the castle at its heart, my wonder and panic now replaced entirely by calm and grit. In that moment of self-realization, I knew it was time. The game needn’t tell me. I could just feel it. Link’s assault on Hyrule Castle feels like just that. It’s a challenge to even make it past the moat, at which point you’re either infiltrating its walls and climbing it from the inside or finagling your way up the outside while dodging giant lasers. It’s also here that the score finally kicks into overdrive, as the orchestra comes to life and weaves a brooding, militaristic soundtrack from some of the series’ iconic melodies. It’s unlike anything in the rest of the game, and while it’s tempting to wish BOTW contained more of these action-oriented sequences, where the lessons you’ve learned about traversal and survival coalesce into some grand test, it’s perhaps even better that Hyrule Castle stands alone as a unique final proving ground. After everything you’ve been through to get there, the actual battle that waits at the end feels blasé. It’s huge in scale and spectacle, but unless you ran straight to Ganon from the start of the game, you’ve done most of this before and survived much worse. In BOTW’s case, it’s an appropriately unmoving bit of bombast, one last flashy test for a hero who’s already proven his mettle. In hindsight, it’s hard to believe one might expect anything different. Ganon could never be as intimidating as Hyrule itself. When it’s all said and done, Hyrule is what you’re left with. You’ll see an ending, sure, but start up your game again, and you’re right back at the moment before you slew Ganon and removed his corruption from the land. Chances are you’ll still have plenty to do, much of it meaningful and much of it tedious. The shrines and their associated quests remain wonderful puzzles, but many of the game’s lingering tasks devolve into rote hunting and gathering. Even some of Hyrule’s most magnificent sights turn into farming opportunities once you know what purpose they serve. But to the game’s credit, you’re not forced to partake in the grind. If all you want to do is bulk up enough to stand a chance against Ganon, playing the game naturally—solving shrines here and there, upgrading your favorite bits of armor with the supplies you’ve come across, stocking up on better weapons as the game doles them out alongside your progression—should be enough. The rest is better left for the completists to worry about. More importantly, the realization that so much of what’s hidden inside BOTW is just there for you to plunder and profit from doesn’t take away the splendor of those first glimpses. Everyone who plays this game will remember the first time they saw a massive dragon flying through the sky or wandered a bit too far off the beaten path and got savagely murdered by a Lynel. These moments, ones of pure discovery and bewilderment, are worth far more than some collectible trinket or overpowered armor upgrade. Those bits of validation are bound to the digital realm, but the feelings our fleeting experiences evoke are real. For me, it took 60 hours for Breath Of The Wild to cease being an engine for creating those feelings and to start being a video game. I can’t possibly imagine higher praise to give one.